Saudi Arabia's Crown Prince Mohammed bin Salman gestures during the graduation ceremony of the 93rd batch of the cadets of King Faisal Air Academy, in Riyadh, Feb. 21, 2018. Saudi Arabia has replaced some of its top military officers in a series of personnel changes that elevate a younger generation, bring a woman into a senior government job and tighten Crown Prince Mohammed bin Sal man’s grip on power. In a reshuffle announced late on Monday, the military chief of staff, air defense and land forces heads and senior defense and interior ministry officials were removed. Tamadur bint Youssef al-Ramah became deputy labor minister, a rare high-level job for a woman in the deeply conservative kingdom. The crown prince, who at 32 is also defense minister and heir apparent, has promised reforms to wean Saudi Arabia off oil exports, create jobs and open up Saudis' cloistered lifestyles. Since rising to prominence three years ago, he has also removed a number of apparent rivals to the throne. His cousin Mohammed bin Nayef was ousted as crown prince and interior minister in a palace coup last June, after which Prince Mohammed restructured the ministry to establish tighter control over intelligence and counter-terrorism. He forced out another cousin, Prince Miteb bin Abdullah, as head of the National Guard last November and detained him for two months in an anti-corruption crackdown in which scores of the kingdom's economic and political elite were held. The latest personnel changes were decreed by King Salman and published in state media. No reason for the changes was given. The overhaul, analysts said, was not directly linked to Saudi Arabia's three-year-old military campaign in Yemen against the Iran-aligned armed Houthi movement. But the war has largely stalled and international criticism is growing over a humanitarian crisis and air strikes that have killed civilians. The new military chief of staff was named as First Lieutenant Fayyad bin Hamed al-Ruwayli. The decrees included adopting a new strategy to restructure the defense ministry for improved organization and governance, but provided few details. Defense contracts with U.S. and European companies have long been a source of corruption and Prince Mohammed has said in a television interview that it is "unacceptable" that high military spending has not translated into better performance. A source familiar with the defense ministry restructuring plan told Reuters it was aimed at reducing inefficiency and corruption but could still face resistance. Khalid Biyari, appointed aide to the defense minister, left his post as chief executive of Saudi Telecom, a possible sign that the crown prince is tapping the private sector to implement reforms. The decrees also included the appointment of three deputy governors from among the descendants of Princes Ahmed, Talal and Muqrin - brothers of King Salman, some of whom may have felt sidelined by changes since his accession to the throne in 2015. One of them, new deputy governor of Asir province, Prince Turki bin Talal, is the brother of billionaire Prince Alwaleed bin Talal, who was detained in the government's anti-corruption campaign and released only last month. Saudi Arabian billionaire Prince Alwaleed bin Talal sits for an interview with Reuters in the office of the suite where he has been detained at the Ritz-Carlton in Riyadh, Saudi Arabia, Jan. 27, 2018. The overhaul was a nod to a younger generation, analysts said, in what has become a hallmark of the crown prince's approach to ruling youthful Saudi Arabia, where patriarchal traditions have long made power the preserve of the old. If he succeeds his father, Prince Mohammed would become the first grandson of the kingdom's founder Ibn Saud to be king after decades of rule by six of his sons. The appointment of a woman at the labor ministry is part of efforts to modernize and promote a more moderate form of Islam. Prince Mohammed has loosened social restrictions, scaling back the role of religious police and permitting public concerts. FILE - Saudi people attend the concert of composer Yanni at Princess Nourah bint Abdulrahman University in Riyadh, Saudi Arabia, Dec. 3, 2017. The government has announced plans to allow women to drive this year, and said women no longer need the consent of a male relative to open their own businesses, a step away from the kingdom's guardianship system. 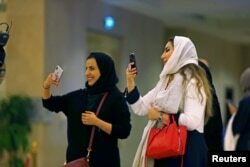 A senior Saudi cleric said last month that women need not wear the abaya - the loose-fitting, full-length robe symbolic of religious faith - and another prominent sheikh said that celebrating Valentine's Day did not contradict Islamic teachings, defying the religious police's hardline position. Greg Gause, a Gulf expert at Texas A&M University, said the injection of more junior officials could help the crown prince cultivate a bloc within the royal family that is supportive of him at younger levels. "But, and this is a big 'but', he is not appointing them to positions in the central government, at least not yet," said Gause. "He is keeping power in the cabinet centralized in his hands."